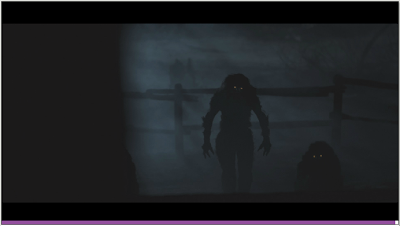 I haven't done a cryptozoology post Monday in a while so here is one about werewolves! Werewolves are a mythological, half man, half wolf creature. Some folk legends say that once cursed, a human will turn in to a werewolf on the first light of a full moon. The idea of the werewolf seems to stem from European folklore dating all the way back to the 13th century. So where did these 13th century writers come up with the idea? Did they dream about it? Did they think they saw something that looked like a half man, half wolf, creature? Or perhaps...what if...they were merely writing the truth? Last Wednesday on SyFy channel's Paranormal Witness, the idea of a real-life werewolf was put in to ponder with the episode "The Wolf Pack". The story goes: A man, his wife and daughter, living in the woods of Palmyra, Maine, in 2005, were surrounded by creatures they simply could not explain and it terrified them. Keep in mind, all stories presented on Paranormal Witness are told by the actual people that have witnessed the unexplainable events. It's sort of like a reality/ re-enactment show. These people truly believe, and to their best of knowledge, know they saw something they have never seen before in those woods. The creatures were described as very large and tall, furry like a wolf, moved in a group of five and did a lot of growling. Interestingly, I didn't hear any mention of the creatures howling as I watched the episode. That would of probably sealed the deal that they were not just a pack of strange looking bears. I knew there had to have been some type of explanation for this particular event. The family thankfully were not harmed by the creatures and lived to tell their story, but what in the world did they really witness? I decided to do some research to see if werewolves might actually exist as a form of undiscovered animal or if there is an animal that seems to be getting mistaken for the mythological beast. Here is what I discovered. Maine seems to be a hot spot for some type of creature that strongly resembles a werewolf. I came across forums where people were confessing their sightings of a very tall, furry beast that growls and often stands on it's two hind legs, but they are sure it was not a Grizzly or Black bear. It seems as though, mostly all the sightings happen at night, which is also something to take in to consideration. Viewing things at night, in the woods, where it's pretty much pitch black without lights, is going to really distort one's vision. I do believe these people are not seeing your average bear, because if they were, they would be able to say it was a bear. 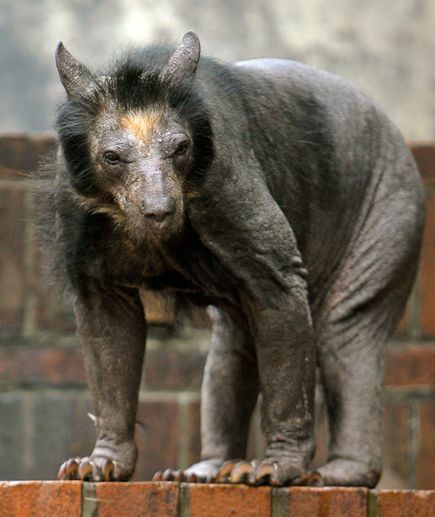 We all know what bears look like, but do we all know what hair-less bears look like? I didn't, until I came across this picture of an Andean bear that was going bald. It looks shockingly like your classic Hollywood werewolf! There is no need for any special effects. The poor thing would scare me if I saw it at night in the woods. I did a little bit of research on the Andean, also known as the Spectacled, bear and it seems as though animal experts have not quite figured out what causes these particular bears to sometimes go bald. The good news is that they do seem to have the ability to grow their hair back in a healthy environment. These bears are found in South America which doesn't make sense if people might be spotting them in the state of Maine, but I still have more evidence that something closely related to this bear, if not this actual species, is roaming the woods of Palmyra, Maine. The Spectacled bear is the close relative of the Florida Spectacled bear! That evidence is at least bringing this bear to the states, but unfortunately the Florida Spectacled bear has been extinct since the last ice age. Then I discovered Demodicosis. Demodicosis is a condition in which an animal's immune system is unable to fight off the mites that infest their fur and this causes the animals to loose their hair. It can happen to Black bears which widely populate Maine, but I noticed that even when a Black bear is hair-less, it still looks like a bear due to it's longer snout and rounder ears. Also, Black bears are the smallest of North American bears. The creature sightings in Maine were reported as being very large. It is possible to come across an abnormally large Black bear, but what are the chances of coming across five of them? Could that have been what happen to the family on Paranormal Witness? I think there is probably some type of undiscovered bear living near Palmyra Maine that is closely related to the Andean or Spectacled bear and it's not a werewolf, but it's probably just has hungry as one. 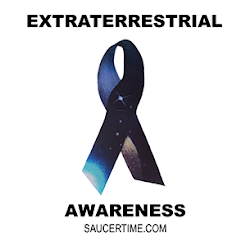 A source for UFO and extraterrestrial independent research. This site is maintained by a UFO eyewitness and independent researcher. Joe Simonton Alien Encounter, Aliens Cook Pancakes! RSS Feed For Saucer Time!